From Paris, where he is attending the 100-year-anniversary of the WW1 remembrance, US President Donald Trump slammed the Californian forest management as the devastation kept raging on. A spokesman for state Governor Jerry Brown blasted Mr. Trump's comments as "inane and uninformed. Our focus is on the Californians impacted by these fires and the first responders and firefighters working around the clock to save lives and property." Related coverage: <a href="http://thegoldwater.com/news/41926-Will-Pepperdine-Burn"> Will Pepperdine Burn?</a>. 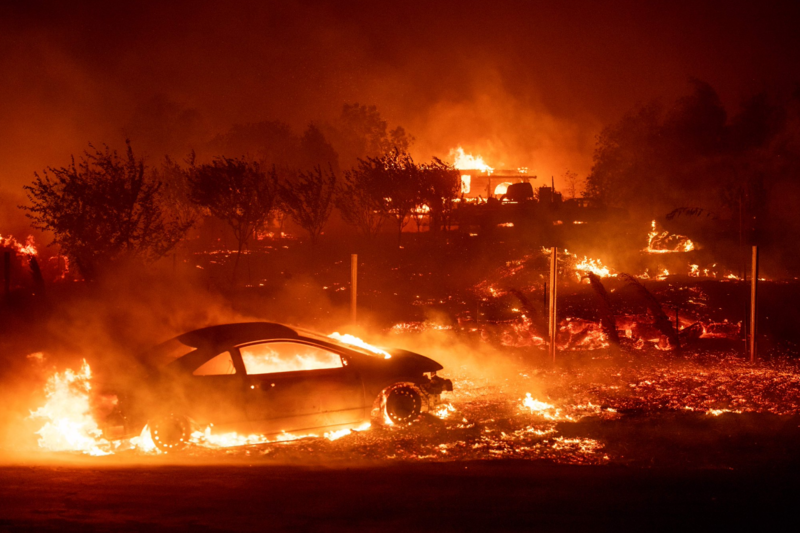 It comes as the death toll of the forest fires has risen to 23 when emergency services found the bodies of another fourteen people who were killed in Paradise, northern California. By now, an estimated 250,000 people have been forced to flee their homes to avoid three major blazes in the state. The deadly blaze known as the Camp Fire started spreading through Butte County as from Thursday and firefighters were powerless to stop it destroying the town of Paradise where most of the dead were found. Meanwhile, another fire swept into the affluent southern beach resort of Malibu on Friday and has now doubled in size. Celebrities were forced to flee their houses. Two of them also responded to the US President. California-born singer Katy Perry called his tweet an "absolutely heartless response", while singer-songwriter John Legend said Mr. Trump "can't bring himself to show some empathy to Californians dealing with a horrific disaster." Is this intentional mis-information? Geoengineering involving spraying aluminum, is more relevant. Read/watch Dane Wiggington at geoengineeringwatch.org and learn about the sabotage in the last 50+ yrs, since weather modification world wide was made legal! Cry me a river for the poor celebrities. All of them could afford to evacuate early and not burden rescue efforts or clog streets with their presence. California chooses to spend 21 billion dollars on illegal aliens instead of services like water and brush removal for public lands. Yep manage the land, or give it to someone who will. Jerry brown loves mexi-thugs and hates his own race. Barbara is right these fake clouds they create are horrible. Besides the adverse health effects on all life that aluminum, barium & only God knows what else. It creates these super hot firestorms due to the volatile nature of powdered aluminum. Add to this the complete disregard of cutting back dead & overgrown brush, shrubs & trees. Not to mention all the $ pulled from the department of forestry & you have the mega fires you see today. When in history have such damage ever been done? This is or is very near the same destructiveness of the fire bombings Japan endured during WW2. Even the great San Francisco fire of 1851 & 1906. Now these were before modern fire codes were implemented… So why are these new fires with modern fire codes implemented more destructive than the ones pre code? Just think about that a minute… OR two. Who ever is in charge of the DEW weapons, fry Oprah house in Monticetto, also her private island in the Pacific Northwest, where she cough cough "helps the children", if you know what I mean! ***, the senile individual i was referring to but failed to name is the idiot governor jerry brown, who when i heard him speak today sounds demented…. Please please, does Madonna have a burnt down pedo palace there with the rest of’em? Home Owners there are fools to build in areas where "Green Policies" forbid clearing a safe fire-free zone around homes. Plus WHY? should TAXPAYER $$$$$ be used Time & Time again to help fools repeat the same mistake Time & Time Again? Calif must adopt Safe US Forestry Dept Practices, or have taxpayer $$$$ cut off for their repeated stupidity.